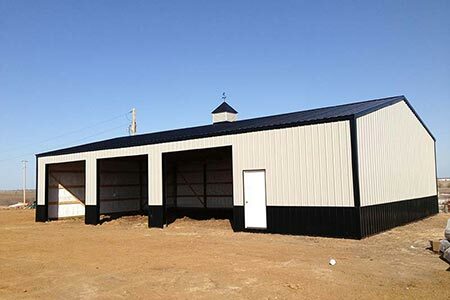 Do you need a barn, workshop, or garage on your El Reno, OK land? D Cross Barn Co. has 35 years of construction experience, and we would love to construct your new barn or pot frame building for you!! D Cross Barn Co. specializes in post frame buildings with posts for piers. Because of the construction, these buildings can be built nearly anywhere—even on unlevel ground! This allows for much more flexibility—we can simply build your barn where you need it! Post frame buildings are also sturdy and long-lasting, and they’re able to be designed to your preferences. Would you like insulation in your walls? Windows or skylights for more natural light? An unusual color of paint? Extra-wide doors? We offer a wide variety of design choices and custom features so your barn can be built exactly how you want it! If you’d like a barn building on your El Reno, OK property and you don’t see it listed here, tell us what it is and we can help you build it! We also build gymnasiums, cabins, and even churches! If you need or want a concrete foundation for your custom barn building (not all our post frame structures require them), we can pour that, too! No need to hire a second company –we can do it all! We can also add walkways and driveways for your barn construction project! Let us help you construct the perfect building! For a free, no-obligation consultation, contact us today at at 1-866-749-7627 or 918-805-7512 or complete the barn quote form on our Contact Us page.